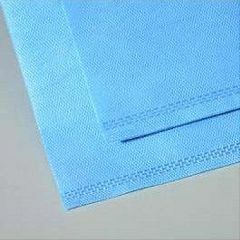 AllegroMedical.com presents The DuraBlue Dual Sterilization Wrap. Puncture-resistant latex-free durable™ sterilization wrap streamlines the basis-weight selection process through a convenient color-coding system and easy-to-read id printing on each individual wrap. All wraps are made with non-woven 100% polypropylene sms technology for superior strength and microbial protection. We offer a wide range of basis weights to meet your sterilization needs. Distinguishable color differences between basis weights. Faster wrap selection and less misidentification. Double-layer wrap has a securely bonded seal on three sides. Decreased risk of compromising sterilization. Exceptional strength across all basis weights.